The great, grand BBC: It’s “neutral”!!! 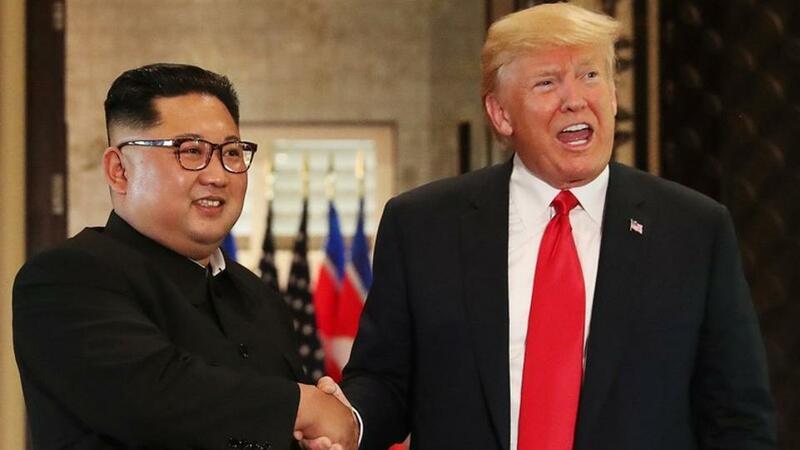 The great, grand BBC was covering the Kim-Trump Singapore summit live. And, as usual it failed to forget its attitude to North Korea: A great show of news-neutrality! “As the US and North Korea prepare for a historic summit, let’s take a step back and look at the crisis that at worst could threaten nuclear war. “Why does North Korea want nuclear weapons? “The Korean peninsula was divided after World War Two and the North developed into a Stalinesque authoritarian system. “It has also has a ballistic missile that experts believe could reach the US, Pyongyang’s main adversary. “In response the UN, the US, the EU and have implemented increasingly tough sanctions. “Why can’t Kim just be removed?” – thus it concluded. Within two minutes of beginning of the live coverage BBC failed to restrain itself from carrying on its designated task: Present a negative image against whoever standing or speaking against the world imperialist system. In this case, it’s North Korea. BBC has not uttered a single word about the US, the biggest threat to world peace and sovereignty of many countries, the economy failing in home and cracking dreams of thousands of its citizens. It’s an economy with a major dependence on war-industry. It’s a ruling system with almost all out surveillance of its citizens. The exceptionally resource-rich economy fails to fund all its schools; many schools have been shut down; and teachers, in their private capacity, in many schools are to arrange education material for their students. In the exceptionally high-tech-society, many of its infrastructures including roads and highways are in torn-down condition; and, cases of mistreatment of patients are found regularly. In the law-rich society, one of its high courts has upgraded man-organized companies to the level of human being in the sphere of electoral politics; and, thus, human being has been downgraded to the level of human-organized company; and, thus, already well-entrenched capital’s clench on politics has further been strengthened. The socio-economy regularly breeds school-shooting incidents, which takes lives of many students of minor age. The ruling system houses the largest prison population in the world. The economy with unprecedented level of resource in human history fails to feed all its citizens, which is evident in its kitchen programs, and by tireless efforts of hundreds of volunteers. The economy creates ghost towns as profit shifts from those places. By skimming thousands of people the economy creates Ponzi schemes including Madoff-cases, and Enron-forgery involving millions of dollars. It’s a political system rife with dubious deals; although its mainstream media focus on private scandals, height of slit in skirt, height of heels in shoe for women, etc. And, the political system is experienced with a long history of aggression and war. But, BBC “failed” to present a picture of the US, which could have made the North Korea-nuclear journey meaningful to the BBC-audience. The BBC didn’t find Singapore itself is surreal, a city-state having a beautiful appearance with a strong autocracy that, a few years ago, had to initiate a program to instruct people to laugh. Or, the explainer could have described the US aggression in Korea region, the bombs it dropped, the number of Korean people killed due to the imperialist aggression and bombing [the death-toll was millions], the provocations it kept on making, the number of forces and type of armaments it stations in South Korea, etc. But nothing was presented. This is “non”-partial presentation of the famous BBC! Its knowledge-biasness is also evident from the word it used in the explainer: “Stalinesque” although there’s no similarity between the Soviet system under Stalin and the political system now in North Korea. If BBC finds similarities with this level of simple comparison, then, BBC should identify the Maldives as “imperialismesque” as there’s a capital city, an army, many guns and colorful uniforms in the island-country, and imperialist states also have these organizations, etc. The MSM try to bring down its audience’s level of rationality/logic with simple comparisons, cheap arguments, semi-facts so that facts are not compared and dissected, and “conclusions” presented by the MSM are not questioned. The approach helps secure capital and imperialist interests as its audience will get habituated with the approach the MSM present. Otherwise, its audience will create questions impossible to attend to by the MSM. The MSM dislikes answering primary questions like (1) from where profit comes, (2) why imperialist countries behave in an arrogant way and trample sovereignty of countries, (3) how war industry enslaves state machine. Has the correspondent’s tweet cited the number of prison-population in the US, and its color-biasness? Or, has it cited the number of persons sentenced to death in the US? Or, what’s the reason that increases these numbers? Or, the way a part of the punishment industry has been handed over to private capital in the US, and the rate of profit in the privately-run punishment industry? The member of the MSM clan unmasks its “beautiful”, a surreal, face as they remain silent on these issues. The MSM-intellect has not said: “Who is running the greatest imperialism – the US – while its commander-in-chief is away”. Does the wise MSM-member know that no statecraft is ever run by individual or a number of individuals irrespective of level of statecraft, even if a small coterie is at helm? Is it rational to imagine that a country being strangulated with sanctions, but capable of developing powerful machine for war turns inoperative due to a few days’ absence of its chief? Even, in the medieval age, did it happen in any monarchy, or in cases of marauding hordes crossing the steppe? North Korea isn’t a “communist dictatorship”. Gleaming through a few pages of Marx will let the great learned member of the MSM know the meaning of communist. It – communist – is a higher level of society that has not been yet accessed by any country. And, BBC feels shy to say that all states are dictatorships of classe(s) – one class or another. And, the US, whatever the country continuously propagates, is also a dictatorship; a dictatorship of certain classes, in which wings of those classes compete, but the rule of the classes remain intact, and remain over all other subdued classes, and in which the ruling machine has never taken any step that hurts interests of the ruling classes. Has BBC referred to the empire’s human rights record? It’s well-informed about that record. Doesn’t it know the human rights report that comes out from Beijing? That report records the human rights condition in the empire. Does the charter of BBC, that governs it, say that only US-voice is to be voiced? Is it a fair representation of facts? And, does it expect that its level of credibility will not erode all after these? Is any comment required with this: An earlier release of menu legitimizes a regime? Then, why not delegitimize the regime by a delayed release of menu next time? A former news-person smells Beijing’s collaboration, etc. What’s the problem if Beijing stays in touch with one of its allies? Doesn’t the empire stay in close contact with its allies? Has not the world’s former greatest power – the UK – stay in close contact with its ally on the other side of the Atlantic? Don’t states keep in touch with other states in the same camp? And, even, on occasions, in the opposite camp? And, have not journalists, on many occasions, presented news prior to all? Is there a word “scoop”? What happened in the case of the UK’s Falkland War, and the US’ Iraq- and Libya-invasions? Have not the great Atlantic allies – the US and the UK – shared information? Don’t the US and Israel share information and coordinate actions? Even, information is shared by the empire with lackey-allies. These facts are known to all readers/listeners of the MSM as the MSM carry such news. Actually, these are a few latest examples from the MSM engaged with creating a public mindset tuned to imperialist interpretation and world view. It’s the great, grand MSM!